The muzzle device is designed to perform a specific task, like suppress flash intensity or reduce felt recoil. This Afterburner compensator is machined from quality steel and finished with an exceptionally corrosion resistant salt bath nitride for a lifetime of service. It utilizes a linear design to direct the high-pressure gas behind the bullet in a straight line away from the shooter, resulting in a reduction of perceived noise. 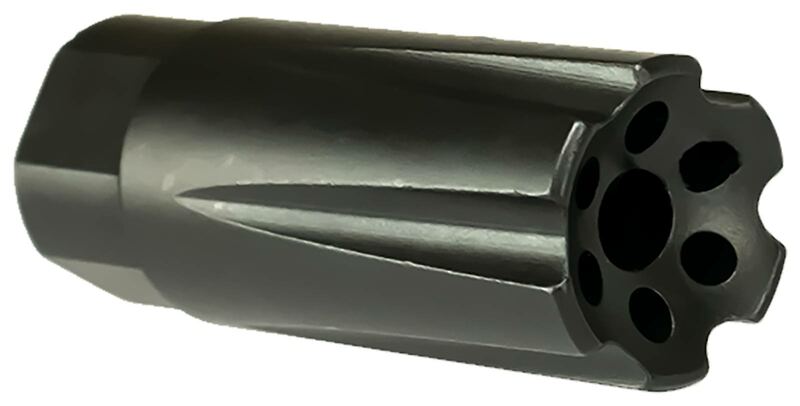 Due to its six-hole design surrounding the central bore, it provides effective flash suppression that preserves the shooter’s night vision by disrupting the muzzle flash when firing in low lighting conditions. Best linear compensator on the market. Have them on a 5.56 Nato SPR and will be using one on my 224 Valkyrie build. Great for area noise reduction as well as linear recoil for quick and stable followup shots.